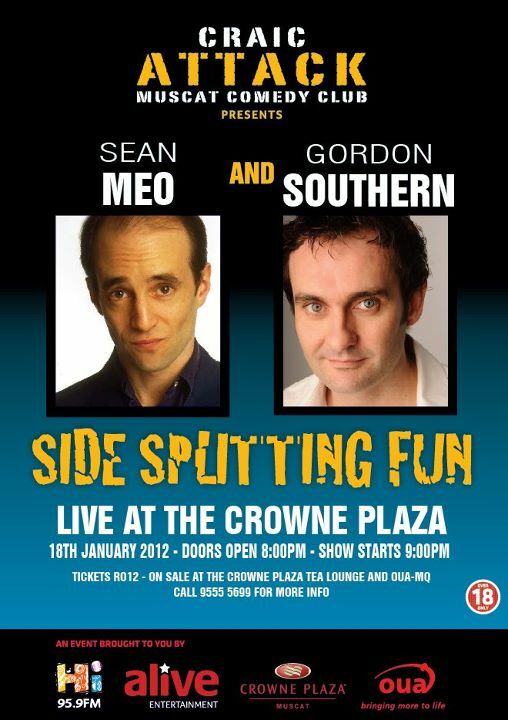 Alive events have planned another comedy show for January 18th, this time with Sean Meo and Gordon Southern being the main draw. Sean Meo a former Time Out Comedian Of The Year and is widely acknowledged as one of the finest performers and writers on the UK comedy circuit. A former professional snooker player, he turned to a career in comedy in 1989. He has performed all over the world including festival appearances in Montreal, Melbourne, New Zealand etc, together with extensive shows in the US. Sean has made numerous TV and radio appearances including The World Stands Up Series, Comedy Central/BBC America USA, The Clive James Show. I'm Glad You Asked Me That - Presenter - BBC Radio 4; The Now Show - BBC Radio 4;Loose Talk - BBC Radio 1; Comedy Network - BBC Radio 1; Breakfast Show - Heart FM. Gordon Southern is a brilliant observational and imaginative comic veteran of more than 10 years at the mic, Gordon was the star of both Weekending on Radio Four and The Cheese Shop on radio. He has also written and appeared on numerous other TV shows, including the 11 O'Clock Show, The Big Breakfast, The Sunday Show and The Gallagher Brothers. Southern is a comic who delights in leading audiences along a certain, familiar path and then taking a sharp U-turn to reveal an even more satisfying vista. In his hands, even a moan about jet lag, or a seemingly mediocre rant about novelty T-shirts gets skewed into something pleasantly, or (even better) unpleasantly, surprising. Another night of great comedy that should not be missed. Tickets are available at Crowne Plaza Muscat and OUA retail outlet in MQ at OMR12. Doors open at 8pm (show 9pm). Contact +968 95555699 for more information. And that's on January 18th, and not a bad price either! I really should go and do some Christmas shopping now.